Beef brisket, soy sauce, brown sugar, lemon juice, garlic powder, pepper, worcestershire sauce. The first taste that hits my tongue is a sweetness, which is very quickly met by a saltiness. With some sucking, I can pick up the soy sauce flavor. Continuing into the chew, I keep getting the salt and soy sauce. In trying to find some natural meat flavors, I don't taste much. What dominates the taste of this jerky is the soy sauce flavor and accompanying saltiness. It's a very salty jerky, however much of that salty taste is offset by the sweetness of the brown sugar. That sweetness is also very heavy, almost "too sweet", like eating meat candy. It's probably necessary to balance out the heavy salt flavor. As I begin chewing however, it departs and I'm mostly left with the soy sauce and salt. Every now and then I bite into a chunk of black pepper and get a burst of peppery flavor. Othewrise, the pepper listed in the ingredients is only really experienced as a background taste. The natural meat flavors are largely missing in this, though some pieces gave me some light tastes. Of what pieces that did offer some meat flavors I got something of a stale or "rank" taste. It didn't taste bad however, for the most part it's still a very palatable jerky. I can even pick up a little bit of that garlic powder. Overall, one gets the idea that this is a jerky that had to be extra sweet just to balance the extra salty. Considering this has no added preservatives, and is a semi-moist jerky, it probably had to be extra salty. For the most, what you're enjoying in this is the taste of soy sauce. These appears to be slices of whole meat, cut from beef brisket, sliced thin, and in medium to large pieces. 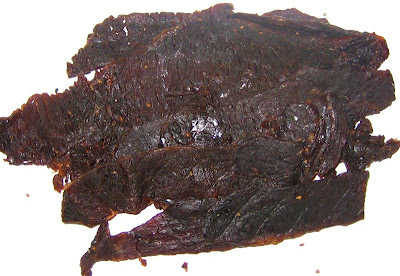 This is a semi-moist jerky, and is very easy to tear apart and chew. With beef brisket, there's a lining of membrane covering the top and bottom of the meat. This membrane becomes pretty soft when cooking brisket, but with this jerky it becomes kinda chewy. After swallowing the meat, this membrane stays behind in my mouth. For the most part, I can swallow it without much thought. Otherwise, this jerky has a good meat consistency that eats really well. Jedidiah's Jerky sells this Private Reserve Original variety from its website at a price of $7.99 for a 3.65oz package. That works out to a price of $2.19 per ounce, putting this into the expensive price range. For general jerky snacking purposes, it has a decent value. This jerky is actually quite snackable I find. I think the combination of the sweet, salty, soy sauce, and garlic flavors provides enough interest for jerky snackers, while the easy-to-eat consistency helps you keep shoveling more of this stuff into your mouth. As an original variety, it has a better value just because of those variety of flavors I talked about. 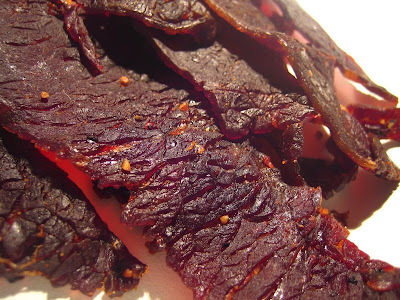 Original varieties of jerky often tend to be plain, and this is far from being a plain jerky. You might even argue that this is a teriyaki variety due to its combination of soy sauce and sugar, but a rather incomplete teriyaki variety since it's missing the ginger. This original variety from Jedidiah's Private Reserve offers plenty of flavors in the sweet, salty, soy sauce, garlic, and the black pepper in the background, combined with a soft and tender meat consistency. But it's a very salty jerky that's also very sweet. While I don't mind a heavy sweet taste, I can't handle a heavy salty one. Considering this has a very high 820mg of sodium per ounce, you might want to consult a physician before eating the whole bag, or drink a gallon of water to flush yourself out. It also has very little natural meat flavors. And what meat flavors it did offer, had something of a stale, but palatable, taste. I'd advise a beer that's light on flavor and goes down easy, like a honey blonde ale, to counter the heavy salt.